Gertrude Stein famously wrote that a writer has to have two countries, “the one where they belong and the one in which they live really.” By living abroad, writers discover their native countries within their minds’ eyes. But what about when you have three countries? This is the situation I find myself in, living in Paris, on sabbatical from my everyday life in Canada, where I moved to from the United States. Can living in Paris help me to discover what it means to be an immigrant to Canada? Before I moved to Canada I had never heard of Robert Burns night. Growing up in New York City in the 1980s I did not know anyone Scottish. At least not to my knowledge. I knew Jews (my family), I knew lots of Irish kids (many of my best friends), Italians, African-Americans, Puerto Ricans, Dominicans, Koreans, Filipinos, Chinese, and just about every other sort of person not originating from Great Britain. Scots I did not know. Canada is another story. In Victoria we have a yearly Highland festival, where I’ve watched large men toss the caber and throw the Braemar stone. There’s a kilt store downtown. And my class rosters are often crowded with Macs. So it’s no surprise that Victoria also hosts many gatherings for Robert Burns night, which I’ve never thought to attend. Because haggis. For the uninitiated readers among you, Burns Nights are annual dinners held in commemoration of the much beloved Scots nationalist poet, where gatherers recite Burns’ “Address to a Haggis” before feasting on the object of his veneration: the “Great chieftain o’ the puddin-race!” Or in other words, a sheep’s stomach stuffed with sheep hearts, lungs, and other sundry offal parts, mixed with oats, onions, and spices. For some reason it has never appealed. There was much laughter at Burns’s disdainful line: “Is there that owre his French ragout / Or olio that wad staw a sow / or fricassee wad mak her spew / Wi perfect sconner / Looks down wi’ sneering, scornful’ view / On sic a dinner?” Actually, the laughter followed the French translation: “S’en trouve-t-il un, qui, touillant son ragoût français / Ou quelque brouet gras qu’une trui vomirait…” If neither of those makes any sense to you, I’d suggest looking up an English translation. 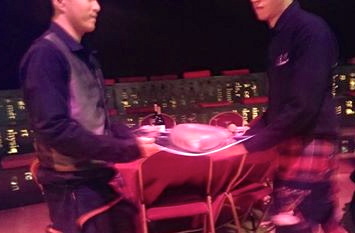 Then the haggis was carried back to the kitchen for serving. You must excuse the poor picture quality, they started pouring whiskey for the toasts before the haggis arrived. Perhaps it was that fine lubricant, or maybe it was the magic of the French cuisinier, but the great chieftain of the puddin-race tasted rather good and warmly satisfying, if in an I’ll-keel-over-if-I-eat-this-more-than-once-a-year-sort of way. Paris can certainly be given credit for what was no doubt the best bread roll ever served at a Burns supper. The haggis came with neeps and tatties, bien sûr, as well as some celeriac purée and several other brown purées to which more cream was added than I imagine is typical in Scotland. Nothing green passed the plate. There was only brown whiskey, brown haggis, and brown vegetable mush. Thankfully, there were also two hours of Scottish dancing (what, as an American, I would call square dancing, and what the Canadians call barn dancing, I believe) following dinner to a live band direct from Edinburgh, whose fiddler happened to have a French mother and speak flawless French. Following the steps as they were called out in French offered a new challenge to my developing language skills! Luckily, despite the preponderance of tartan in the tent, few of the French guests had any better handle on the dancing than I did. It was so much fun, now I want to go square dancing in French every weekend. At the very least, when we return to Victoria, I want to make a habit of attending more Burns night celebrations, as long as there will be whiskey, haggis, and dancing. Perhaps it required being in Paris, but I find myself coming into touch with my Canadian-Scottish heritage. 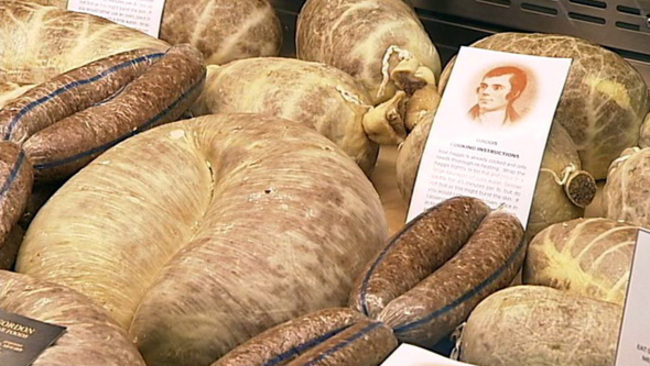 Je souhaite que je venais avec vous pour gouter le haggis style Paris!